Snrky: All you did was switch from radio buttons to a drop-down. All you did was switch from radio buttons to a drop-down. A pivot is a “structured course correction designed to test a new fundamental hypothesis about the product, strategy, and engine of growth.” A notable example of a company employing the pivot is Groupon; when the company first started, it was an online activism platform called The Point. After receiving almost no traction, the founders opened a WordPress blog and launched their first coupon promotion for a pizzeria located in their building lobby. Although they only received 20 redemptions, the founders realized that their idea was significant, and had successfully empowered people to coordinate group action. Three years later, Groupon would grow into a billion dollar business. Billion dollar idea. I'm pretty sure the pivot I heard announced the other day wasn't worth more than $100. Title: All you did was switch from radio buttons to a drop-down. 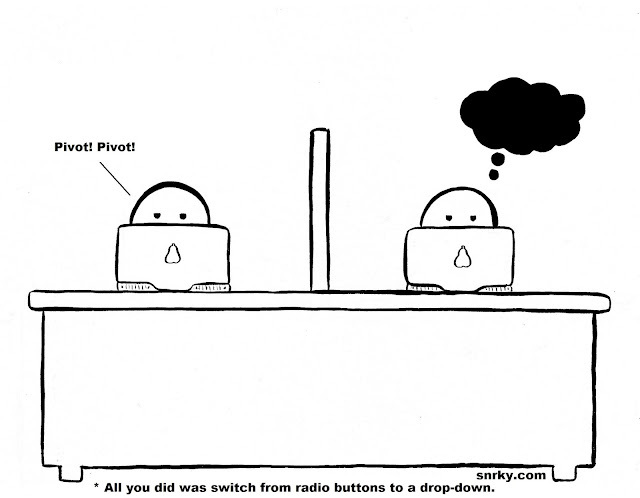 I just recommended the word pivot to someone as an alternative to refactor. The business likes pivot but hates refactor.